I haven’t cried this much over a book in a long time. Set in the 1920s, The Light Between Oceans tells the story of lighthouse keeper Tom Sherbourne and his wife Isabel, who live on a remote island off the coast of Western Australia. One day a small rowboat washes up to shore. It contains the body of a dead man and a crying baby. Having suffered a series of miscarriages, Tom and Isabel decide to raise the child as their own. As the story plays out, the consequences of their decision unfold. 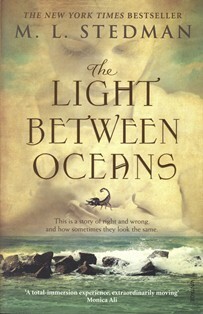 My book cover describes The Light Between Oceans as “story of right and wrong and how sometimes they look the same”. It’s also about parental love and loss, choice and the consequences of our decisions. There’s a lot of moral ambiguity in The Light Between Oceans which makes it all the more heartbreaking. I felt so sad for the characters as I tried to figure out whether Stedman could give them all a happy ending. True, I am currently six months pregnant and my emotions are in overdrive (probably not the best time to be reading about miscarriages and infertility). But if you’re a parent, parent-to-be or have ever been faced with the prospect of being unable to have children, it would be difficult not to be affected by this book. It is Carmen - enjoy! A very sad but realistic book about the longing to have a baby, an honest mans love for his wife and a mothers love that's stronger than the will to live. Beautifully written, sad and real.